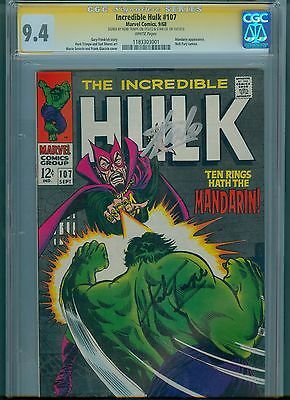 CGC 9.4 copy of Hulk #107. This high grade copy has white pages and is signed by Stan Lee and Herb Trimpe. Books will be shipped Priority Mail with delivery confirmation unless you request otherwise. Foreign bidders are welcome. However I will not understate the value of the item on the customs declaration. Please leave feedback for me when you receive the book. This tells me you received the item and find it acceptable. I'll then leave feedback for you. All purchases are professionally packaged and are shipped within 48 hours of my receiving cleared payment. All non-CGC books are strictly graded and guaranteed to be unrestored. References available. Order with confidence.